St John’s is located in a spacious, rural setting surrounded by cane fields and nature. Students spend a lot of time participating in outdoor activities because of our natural environment, lifestyle and our large undercover multipurpose area. Our modern, well-resourced library is also a hub for much active and engaged learning. 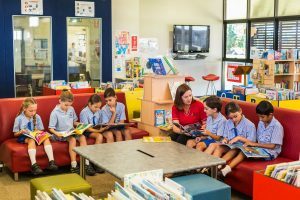 The St John’s School library is an important information and resource centre for teachers and students. The school keeps an up-to-date collection of fiction and non-fiction books. All children visit the library weekly. Children are allowed to borrow up to 3 books each. Books can be borrowed for one week. Loans can be extended, however the book must be returned to school by the due date for the extension to be organised. If a book on loan becomes damaged or misplaced, parents are required to pay for the replacement of the book. Parents are welcome to browse and borrow from our school library. Parent helpers are always welcome and appreciated.